Dynamite Entertainment has a long list of great powerful female characters. Red Sonja, Vampirella, Jungle Girl, and Lady Zorro are just some of those fantastic women in comics. I was glad to hear that Dejah Thoris was getting her own series, taking center stage and emerging from John Carter's shadow. She's a brave and fearless leader who serves as Princess of Barsoom. She deserved to helm her own title and it's finally here. I just wished her first exploits would have been more original. Frank J. Barberie is usually a very capable writer and while he establishes the plot against Dejah early on and swiftly what follows is almost by-the-book storytelling. Her father, the king, has gone missing. Suspicion leads to the imprisonment of Dejah and almost that of John Carter. A shady and opportunistic councilmember, Valoris, is ready to take the throne in the king's absence and the jailing of the princess. John sees the convenience of all this as we the audience do which makes things all too predictable. Dejah escapes after her lineage to the throne is questioned and sparks some memories of her adoption. This leads her on a quest to find out who she really is. A lot happens in this issue, all plot-driven, clumsily and hastily executed. The pacing is clunky because so many contrivences occur to push the narrative to the next plot device. Dejah still comes across as a proud and resilient character but despite some thoughtful monologues 'Dejah Thoris' #1 is about getting issue two not enjoying issue one. The issue's saving grace is the amazing work by artist Francesco Manna. His character designs are graceful and of course Dejah herself commands the page with her presence. Manna provides a lot of detail and the action is well composed overall, building the world Dejah inhabits with a familiar eye. 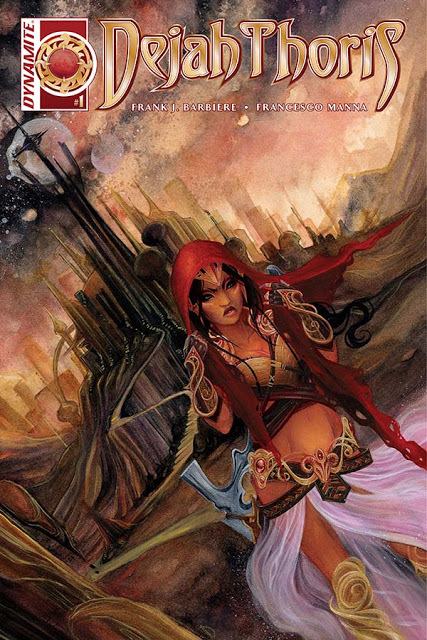 'Dejah Thoris' #1 isn't terrible it just isn't very ambitious. The problem facing this first issue is meeting the expectations of a popular and well-known heroine which it fails to do. The proposed "shocking conspiracy" is rather obvious and clumsily conceived. It's all too cliched and not the great adventure I'd hope for Dejah to partake in. Dejah deserves better than this and I can't recommend this title.